Recently I have begun hanging out at the Starbucks near the community college with my Venti Skinny Vanilla Latte while Jacob is in class. It really doesn’t make sense to drive nearly 30 minutes to the school and nearly 30 minutes back home, then do it all over again in a couple of hours. Can we say, gas prices?? Cha-ching! So I pack up my bag of tricks, drop Jacob off at school and head over to do some “work” at Starbucks. Think, Mary Poppins’ bottomless bag. Who knows what else is might be in there? I come each time with very high hopes of great accomplishments—intentions to get everything all read and planned for my Thursday co-op classes, get a blog post written, respond to emails, and read a few chapters in both book club books. No big deal, right? But alas, I never fail to be sidetracked by the many distractions around me. I think my failure to accomplish all my plans might be due to an affliction akin to having eyes bigger than your stomach. You know, the best laid plans and all that. I have come to the conclusion that the whole multi-tasking thing is a big lie. It is simply doing many things with little success. Here is the predicament in which I find myself—starting one thing before finishing another and then forgetting ever starting the first thing. For years, I have somewhat jokingly called myself ADD. Nothing official, of course, but clearly the signs are there. 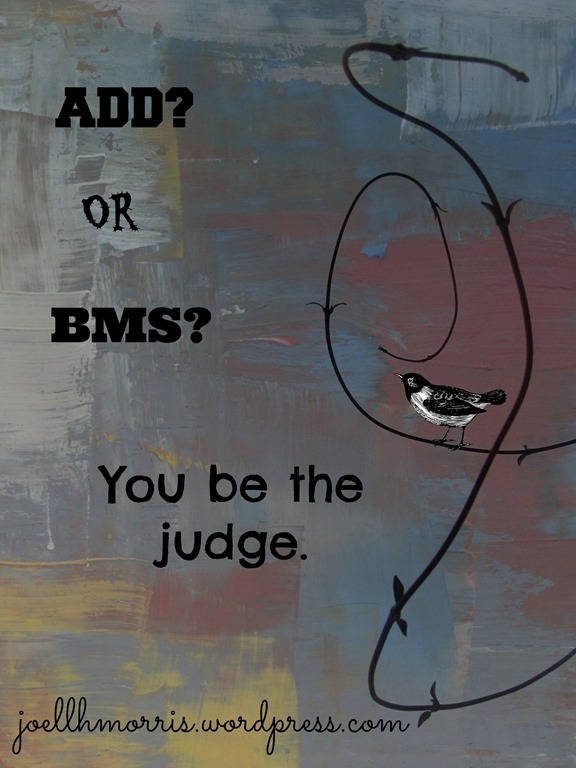 You could probably, more accurately call my problem BMS—Busy Mother Syndrome. My life is full of distractions, yet I just keep pressing on, doing the next thing. Putting out fires as I go. And hoping all the important stuff is done. However, occasionally, I will manage to focus long enough to actually finish something during my Starbucks visit before I have to return to collect Jacob—like today! But, hey, even a blind squirrel gets a nut every once in a while, right? This is my offering for Two Shoes Tuesday. Each week, Josie gives two word prompts to choose from and you must include one or both of them in an original essay, poem or story. You can use them as a theme or the words themselves. This week’s words were distraction and tears. On Fridays, a bunch of writers set the clock and write for 5 minutes, no edits, just writing, throwing perfectionism out the window. Completely cray-cray, right? Yes, well, the prompt this week is the word SHE. She was always there for us when we were kids. Always. Waking us up for school. Always making sure we had a hot breakfast. Always there for us after school. She was there when my dad was away traveling, which was often. She put up with so much crap from us, all three of us. Well, very little crap from my little brother—mostly from my older brother and me. She expects honesty from people, which is no less than she expects from herself. She lives that out in her life. She prayed without ceasing for us kids as we were growing up and for my Dad and so many others. I remember seeing that little plastic set of praying hands sitting on the window sill over the sink—the ones that held the list of people she prayed for as she slaved away over the dishes. She trusted me as a kid, as a teenager. I have no idea why, but I felt it from her. I never wanted to let her down, though I know I did, many times. 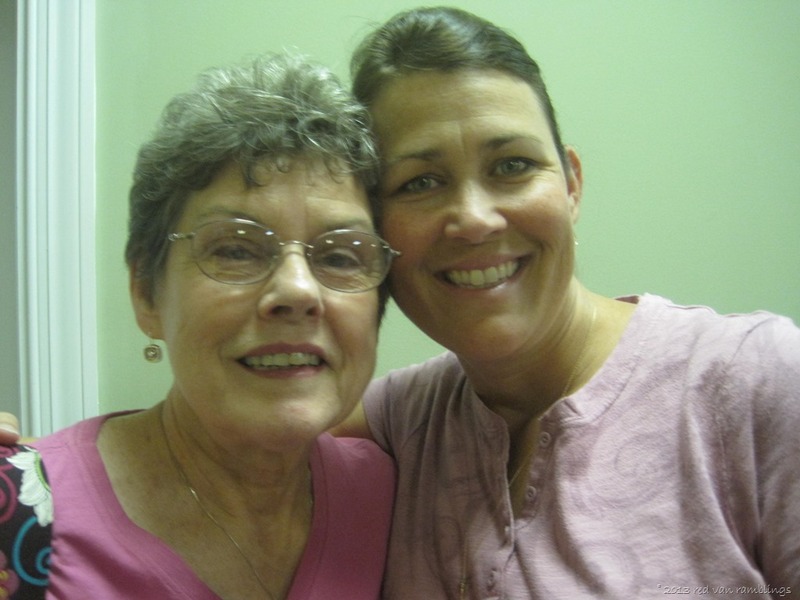 Though she tends to live her life in a reserved, sit back and take it all in, kind of way, I remember how she would laugh hysterically with me in the aisles of the Hallmark store at those crazy cards that struck us both as so funny. People would stare at us as we laughed till we cried. But we didn’t care. She takes care of people. Always has. And now she takes care of my two grandmothers who are both in their 90s. Without complaint. And thinks of their needs before her own. She has spent her life doing that—taking care of others before herself, leaving her very little time for a life of her own. But it’s what she does. She is a godly woman. She’s a wife. She’s a mom. She’s a grandma. She’s a giver. She is filled with integrity. She is an example to me. She is my friend. She is my Mama. And I love her. Want to link up your Five Minutes post? You can. Visit Lisa-Jo Baker’s blog–here. I just call it good parenting. I remember when I was about 12 years old and I would spend all day in the summertime at the neighborhood swimming pool. I would ride my suh-weet pink 10-speed there, by myself, wind in my hair, towel around my neck, a dollar for some snacks from the vending machines, and BAM! I was ready to spend the day with my friends. This was around 1982. When there were no smartphones and no way to really track your kid’s every move. At the pool back in the day, there were only lifeguards and the moms of toddlers and a phone, with a cord, attached to the wall. I would stay there all day sometimes. Had me a really nice tan, too, y’all. Because it was. It was a time when you could let your kids roam the neighborhood and ride their bikes around town. And stay out till dusk and just give a holler when it was time for dinner. Maybe it was because it was a small town. Maybe it was because I was basically a good kid. Maybe it is because back then, you knew pretty much all your neighbors and everyone looked out for everyone else’s kids. People weren’t so busy with their own lives (or so afraid of someone else’s mama) to prevent them from calling out some child who was misbehaving. “Hey, you, I see what you are doing there! You better straighten up before I call your mama!” It really did take a village, and the village actively participated. It was a different time. Not so, now. Now, in the 21st century, with all the social media outlets, internet, cable television and smartphones at our fingertips, and with all the crazies out there, documented for us daily on the world wide web and the nightly news, and where we live in neighborhoods of transient people whom we barely know, we have to be different kinds of parents today. I find myself hovering and asking questions and needing to know things and having to tell my kids things that I don’t think our mothers before us had to do. Oh, don’t get me wrong—I thought my mom was the most interfering mom ever! She wanted to know who, when, where, and what. And she wanted me to call her and check in. Oh, the horror!! She was, and is, a good mom. There are things happening today that did not happen when I was a teenager—at least not to my knowledge, or not in the circle of friends I chose to have. There are things I might have done, but was too scared to do because, “what if my parents found out.” I valued my reputation. I valued the relationship I had with my parents. I respected them. And I did not want to disappoint them. But I was a moody teen and was kinda sassy, and of course, I wanted to try to get away with as much as I felt like I could. I know there were times that I made some poor choices and did disappoint them. It felt terrible at the time. I learned some good lessons, thankfully, without any long term repercussions. I say it’s just sad. I am so sad for those young ladies. And it breaks my heart to think about the reasons why they do the things they do. I am thankful to have a daughter who respects herself and who understands that she is a child of God and holds herself to a higher standard. She is so much more together than I was at her age. So as I am calling or texting Emma and reading her Facebook wall and wanting to meet her friends and their parents and the boy who wants to take her to the Military Ball and making sure our internet browser has a good filter and asking her all the who, what, when, where, why and how questions, she calls it stalking. ‘Cause what else is a mama supposed to do in this day and age? We have to be vigilant. We have to pray for our kids. 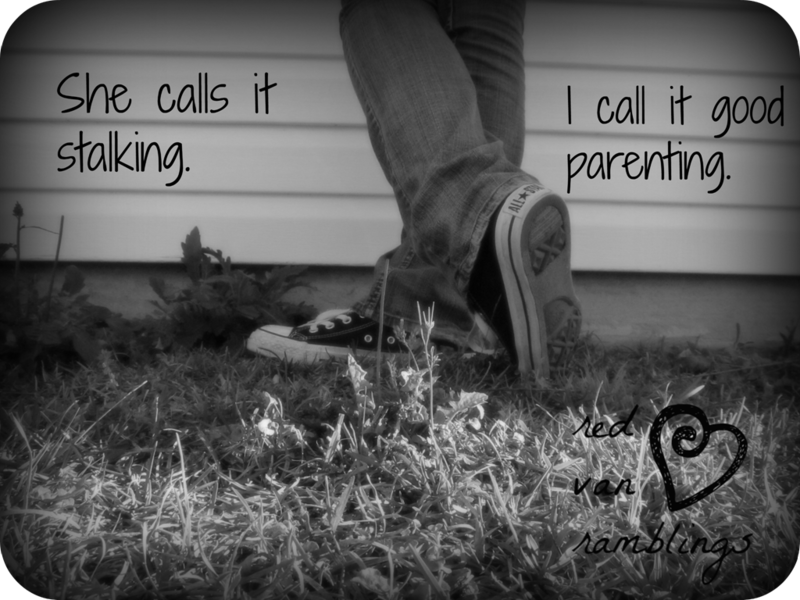 We have to talk to our kids and know what is going on in their lives. Even if it seems intrusive—or stalker-y. We need to make sure they know the truth. I am not perfect and neither is she. We are both going to make mistakes. But we talk to each other and I will continue to stalk her—mercilessly. And pray without ceasing.